BELLINGHAM, WA (January 2008) -- Kathy Sheehan, writer, editor, photographer and publisher of The Sheehan World, is pleased to announce that one of her photographs has been entered in "The Public Hanging" show at the Blue Horse Gallery here. The Blue Horse Gallery exhibit runs Jan. 15 through Jan. 31. An artist's reception was held from 5 p.m. to 8 p.m. Friday, Jan. 18. Sheehan's entry is a 16X20 color photograph entitled "Ketchikan Rain." Taken on a trip to Alaska in 2005, the photo focuses in on falling raindrops and a watery reflection of some colorful buildings in a creek in the center of Ketchikan. 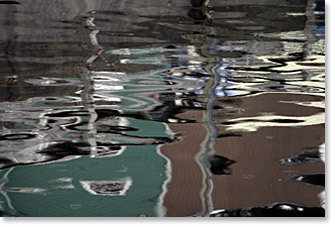 Part of Sheehan's reflection series of landscape photographs, "Ketchikan Rain" evokes Pacific Northwest Indian art, with its rippling aquas, browns, grays and blacks. The photo, which earlier hung in an employee art show in Ferndale, WA, will be exhibited with art from more than 80 regional artists at the Blue Horse Gallery. Gallery visitors will have the opportunity to vote on their favorite piece, with the artist who gains the most votes invited to have his/her own exhibit at a later date. Sheehan, who is also a principal photographer for PhotoSynergy in Bellingham, has previously exhibited at the Rebecca Melloy Gallery in Fairhaven and the Staff Art Show at Western Washington University.